This photo, taken by Eve Prentice, shows a few of the 40 Bikes given away in 2008. We were fortunate that many of the bikes were sponsored. 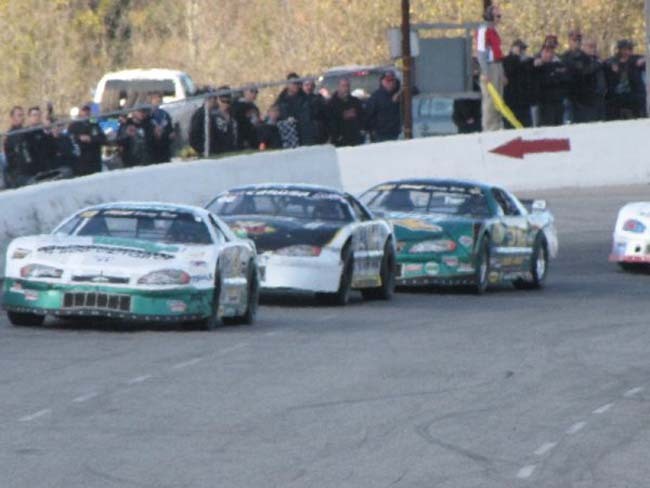 Our goal is to do this again in 09′, only instead of them being given through Gary Elliott Racing, I’m hoping the Late Model class will take on this commitment for the young kids that cheer for us every week. I’m thinking we would give away 2 a night, a boy and girl bike, and if we have 20 teams, that’s less than 2 bikes a night each, about $200 per team, maybe less if we can get a deal on the bikes. I’ll ask Late Model drivers at the rules meeting in January and announce the resuts here. I know the cost for racing is expensive, and with Flamboro not giving us a raise, it may be tough for racers to commit to this, but hopefully everyone has enough in their budgets to buy at least one kids bike in 09′. The annoucner would say “tonights Late Model Kids Bikes are presented by Paul Howse racing”…etc, and Paul and his team would go out on the track at intermission and present the bikes and get a picture with the winning boy and girl. 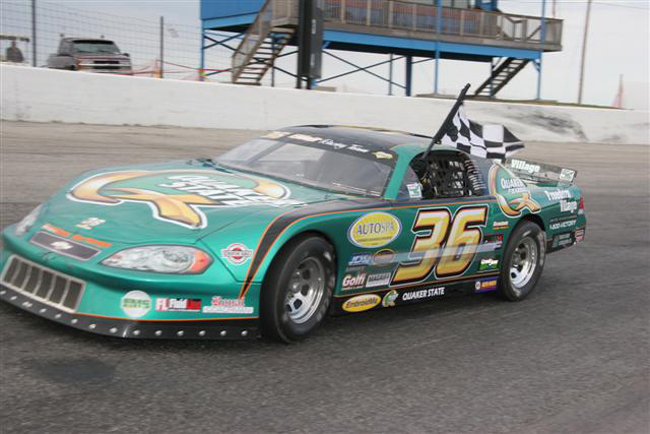 Okay..no Mean Green Machine..After winning Best Appearing Car in 2008 we wanted to go with a different paint scheme in 2009. This two-tone version will have gold trim between the black and green and feature gold’s, orange and grey’s in the number and maybe checker flag again, although we’re not sure how that will look. Getting this car painted was driving me nuts. I wanted it two-tone like in 08′ but wasn’t exactly sure how the two colors would go. Jim Sweers painted it and when he finished the black he said “ok, how do you want the green, lay it out for me”. I had a basic idea but actually created it while we put on the masking tape. “Okay, we’ll go over here, and around here, and over the roof” and when it was done it turned out very good. Things got worse with the #9 car. I wanted it to look different than #36. The color combo’s have been giving me huge stress. Finally this week end, after at least 4 different changes we came up with a layout that I liked. Of course the lettering will be a repeat of this deal in how we accent the car. We care so much about what we bring to the track it’s almost insane….but in a good way. The lettering will be done by Steve Lyon’s. Jim will likely paint our rebuilt CVM when he gets back. The racing world got a lot sadder this past week with the passing of our good friend Brock Laking. All of our family and racing team want to express our deepest sympathys to the Laking and family for the loss of their precious loved one. Brock was only 67 when he lost his battle with cancer. But like in this picture he was a winner to all of us. We thank God for giving us the opportunity to know Brock and his family. There is a tribute to Brock on our Message Board. We have come along way since early November. 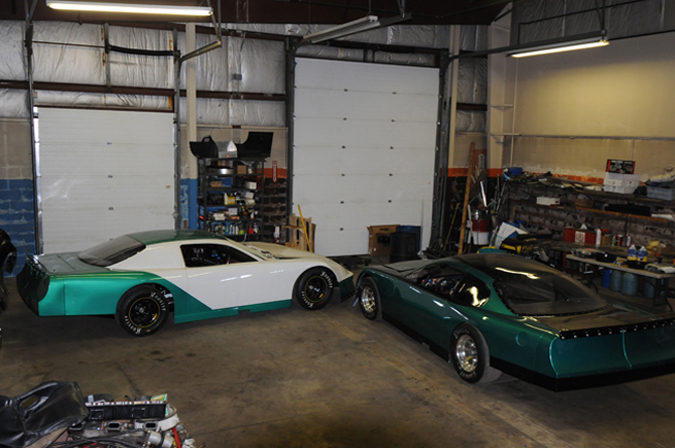 A total team effort has helped get these two cars almost ready. The CVM is ready for assembly and the Thunder Car is being disected. Our trailers still have to be gone over as do our spare parts. We also need to complete a pit cart for the Lancasters and a trailer for the CVM. The government said “we must go green”, we thought they were talking to us!! No kidding, everything is green, but don’t count on the body being green, then again, don’t count it out either. I had 4 color combinations for both Late Models and didn’t use any, it was a last minute decision for the final paint scheme. We may use some green in the Coupe. I sort of wanted to go to the Charger green, like we did on our Mini Stock in 1971, but Jason Densmore CVM #62 has that color, similar to what David ran in his last season in the CVM. 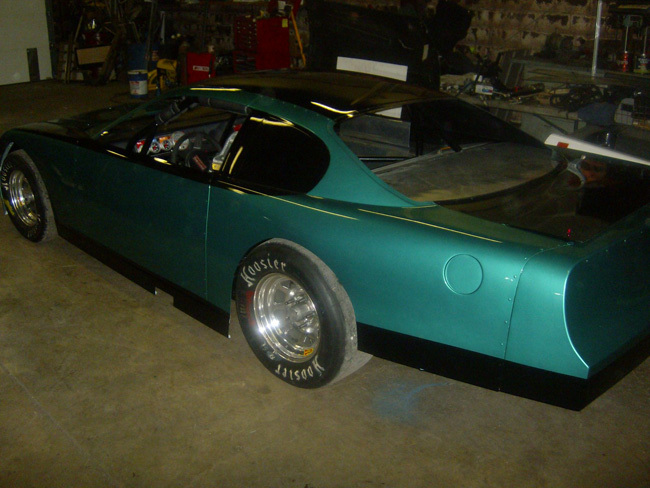 Anyway, we are getting closer to putting the body on and making new sides, and hood, then it will be sent out for paint…….we took the inline apart and found nothing wrong, so hopefully we get a season out of it…this just in “Gary’s inline lasts a full season and the Leafs make the play-offs”. We were struggling with the car last Octoberfest and think it may have been the distributor, so we’re putting a new MSD distributor and new carb. We made a new steering shaft and got a great seat from the Thunder Car that is now in the Coupe. This car badly needed a face lift and got it this winter. We should be posting a picture next week of our Coupe heading for paint….this will be our 20th season with this body, 33 Chev 3 Window, and 11th with the chassis. It will also be the 38th as a Hobby/CVM member. With both Late Models near completion we set our sights on getting our 33 Chev ready for another year with the Hobby boys and girls. 2009 will be my 38th season with the club. 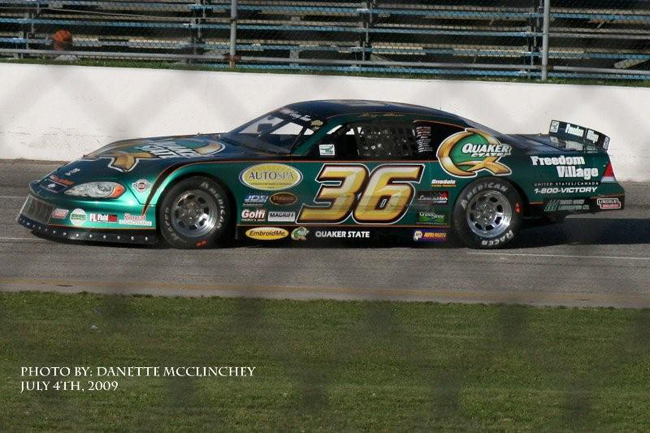 The past 4 seasons have seen other racers drive our car, Jesse Pontello in 05 and 06. Josh Korenyi in 07 and last season Leanne Ruelens ran a few nights. Over the past 4 years I was able to get a few outings. I wanted to run the Twin 25’s. 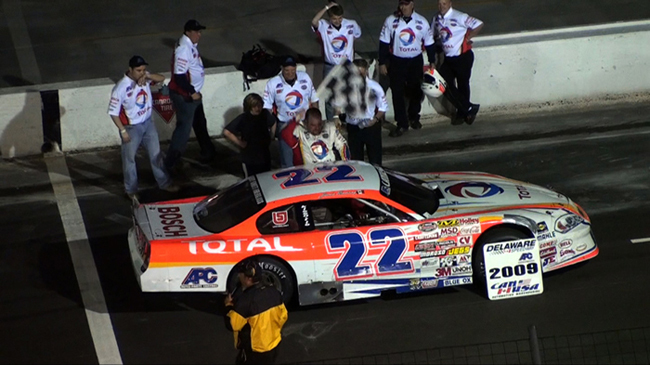 In a few of those sparse opportunities the car suffered engine failure, but we did get lucky winning the feature in 07. This year Jason Lancaster will run all but 4 races. Those 4 I will pilot the Chevy at Flamboro shows that will include the End Season Championship. In 33 years of full time racing with the Hobbys’s I never won that special event. I have won the Twin 25’s and Mid Season Championship but never the End Season, so that race will be one I look forward to as well as the Clash. Jason ran F-4’s the past two seasons and can’t wait to get racing with the Hobby club. Rick Book was a tremndous help getting the body repaired. The car will head to Jim Sweers for paint then to Steve Lyons for lettering. 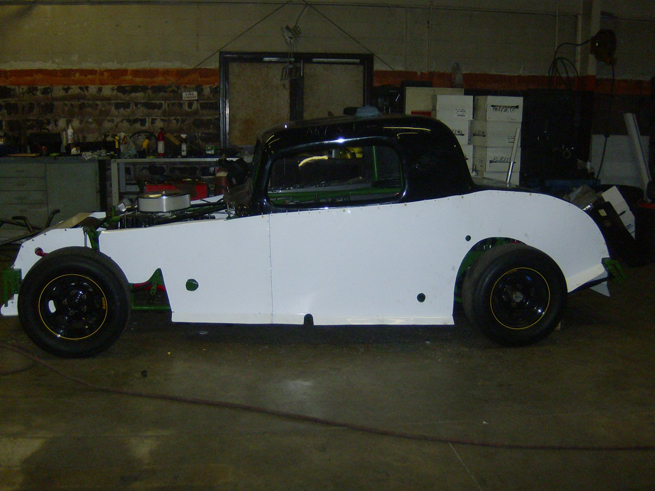 Things are finally taking shape as the season approaches…what’s mising?…our Thunder Car. It’s not actually missing it’s being reworked by Mike, Rick and Glen. We will post a picture of their progress on our TC later this week end. The Late Models are gone to Steve Lyons for lettering and the CVM is waiting for paint at Jim Sweers shop. The Thunder Car is taking shape but has a ways to go before paint. Here driver Pastor Mike Van Slingerland works with crew members Rick Dyson and Glen Hils. Carl Sault has been helping out as the Camaro gets some serious rebuilding. Mike is not planning on racing until early May and might even run the Oldsmobile for the first few weeks. We want to make sure the Camaro is ready to battle with the stars of the Thunder Car class. Mike will be ready for the Camaro once he has a few nights in the Olds. Going from the Olds to the Camaro with it’s Crate and Power Glide will be a night and day progression. Our trailers are being completed, getting a safety inspection and spare parts stocked. Jeff’s pit cart is on the list of things to complete and then we’ll scale the cars before practice day. It’s been a long winter but not exhausting considering we have kept the work nights to Monday and Wednesday and half a day Saturday. Hoefully the Late Models are all dressed up by this week end and we can get their pictures up on this site. 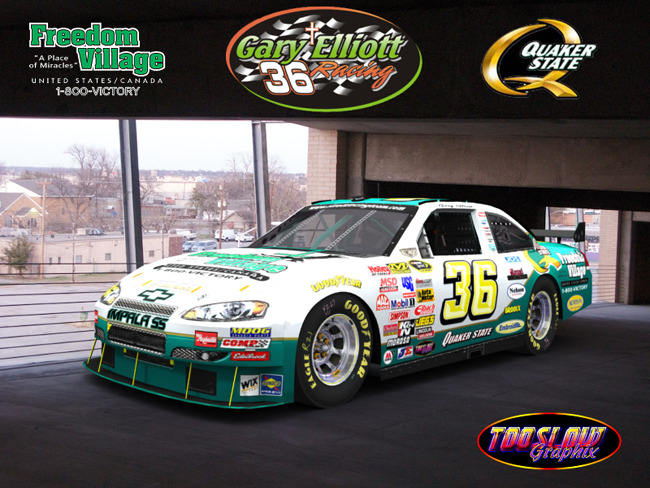 With only three days till the start of the 2009 season, we present our newest Late Model. Painted by Rick Book and lettered by Steve Lyons we are thrilled with how awesome this car turned out. 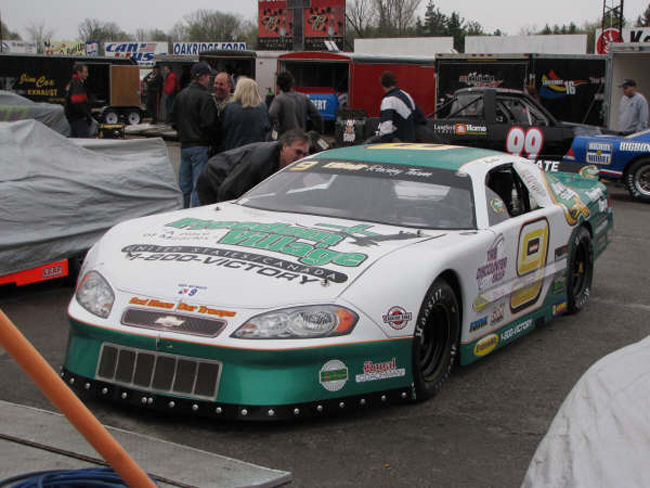 I chose #9 because as a kid, Vic Parsons was my favourite Late Model driver. Even more than that, the number of my hockey hero was Andy Bathgate #9 of the New York Rangers. In 1985 we ran #9 on our Hobby car for one season. The car was completed this week after a rough but beneficial practice session last week end at Flamboro Speedway. 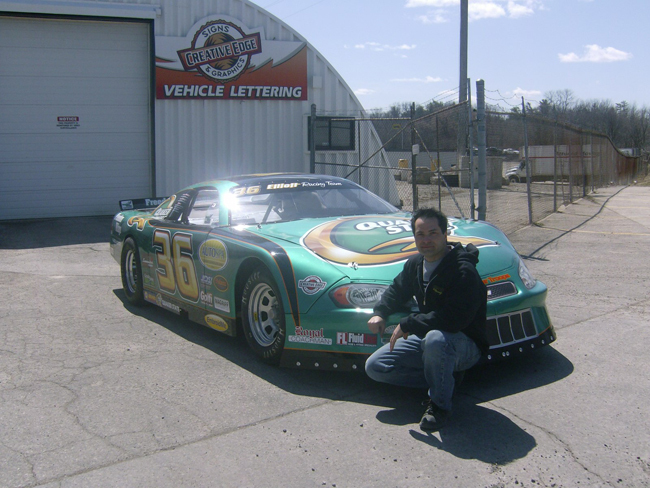 Jeff Lancaster will make his debut in Late Models this week end at Flamboro. The former Funny Car ace will have a double debut as he not only races his first Late Model, but will be the first driver to race our new car. 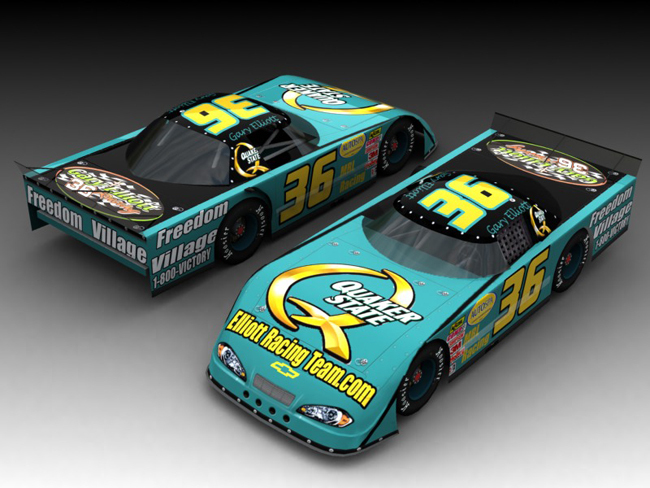 We have been so blessed to have Freedom Village as the primary sponsor on this car and the secondary sponsor on #36. Our crew, the Lancaster family and all of our sponsors have made it possible to venture into a multi car team and be ready for this exciting season. I will get to drive this beauty at Delaware on May 1st for their opening night. It’s hard to believe this is our 41st year of stock car racing. I know for sure that if I had the chance to do it all over again I would, without hesitation. A friend told me in 1972, in my 4th year, “you are too obsessed with racing”. As it turns out, he was correct…no kidding!! This is our 5th season in Late Models, and yes, there are some very tough competitors we’ll have to deal with every Saturday night, but we all feel this is our year to take a serious run at the Flamboro Points Championship. I know we can do it, it won’t be easy, and it won’t be based on just what we do. We’ve been blessed in this journey and know God will continue to bless us again in 09′. In spite of our 4 car team, knowing that I may be worried about the other cars, my crew want me to focus on the title, so do the boys from the #9, CVM and Thunder Car teams. In fact they’ve all helped get us to the starting gate in good shape…so, God willing, we’ll have a shot at our first Late Model title…and He will get the glory. I guess depending on how you look at it we are 2 for 2 on rain outs or “O for 2” on racing. 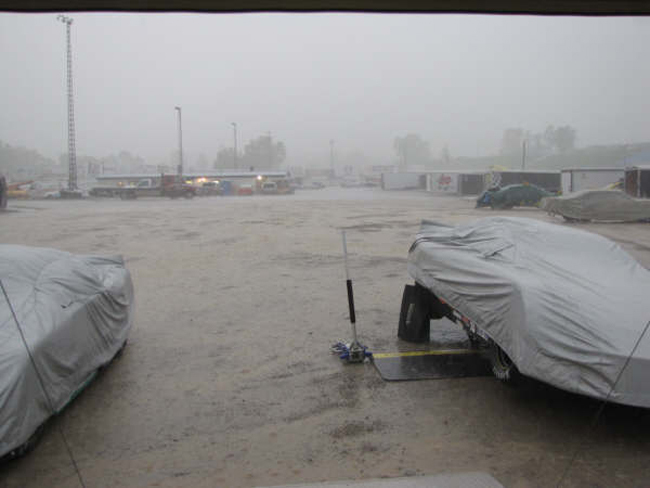 It rained very hard in the London area forcing the Delaware Speedway promoters to cancel their opening night. We didn’t even get one lap as the rains came around 5pm and lasted until 8pm. So far we have no idea how the #9 will be on the track….maybe tonight, although it’s calling for rain….more like snow by the time the sun goes down. What a disappointing night for all of our team. Jeff and I did okay for our season opener considering all things, but the downer came in the CVM feature when the engine in the CVM blew (wow what a surprise). The track starter for some reason did not hear or see anything out of the norm, so did not turn on the caution light. The race leaders came around at least 8 seconds later and were confronted with less than perfect track conditions. A 7 quart oil slick awaited them and Phil Shaw, who was leading the feature t-boned the Coupe at almost full speed. Brian Atkinson who was running second also ended up in the wall..both cars unable to continue. Jason was very lucky, because as he sat in his car for almost 10 seconds he did not undo his seat belt. Had he taken them off he could have been badly hurt. There is 2 issues here…the inline blowing up and the starter not getting the flag or caution light on. The whole story is on our message board under “Inline Out Of Line”. I’m glad no one was hurt, but this incident will set us back for our quest to run the CVM season. We’re not giving up, maybe we get an engine donated to us…maybe the Crate V8 gets voted in before our next show…hey that’s $5000 we’ll spend for the complete change over. As it is, if we send the engine out it will cost the best part of $3500 to $4000 to fix…at least that’s what’s been the past 700 times. 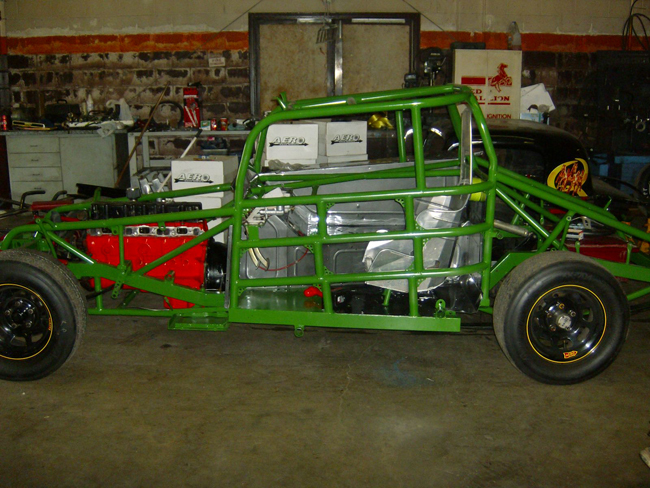 As it is now we could be done in this class for 2009 and longer if the Crate isn’t accepted….my buddy said to look at it in a positive way…we saved the money to letter the car. JBM Autoleasing 50 Lap Feature……Rained Out !!! After a rain out on May 1st both promoters and drivers were anxious to get opening day completed at Delaware Speedway. It was the first leg of the JBM Autoleasing Triple Crown. It will have to wait until next week…..This picture is courtesy of Jim and Sherry from JWO Racing, members of the Thunder Car class at Delaware Speedway. The Thunder Car class was off Friday night but Jim and his family came to the races to watch what should have been an exciting Late Model 50 lap feature. They got this shot from the top of the grand stands..…With no practice because of testing David’s Pennzoil #37, we had our first laps in the #9 Freedom Village Impala, our new car, one I barely know, other than working on it all winter with our crew and the Lancaster family. We turned a 19:91 our first lap and a 19:54 on the second. The lap times put us 18th on the grid. The Late Model feature was the first to go but was cancelled due to a heavy rain down pour by lap four. This Friday night Delaware will run the final 46 laps of the 50 lapper at the beginning of the race program. Then regular racing will resume for all classes including Late Model heats and a 35 lap feature later in the evening……The Thunder Cars will be at Delaware next week……..Check out our message board under “Diary Of A Season” for the complete story. This picture, taken by Jim Ott, shows a fairly stable Freedom Village Impala going through the turns. Truth is, our car was far from stable, we fought a dangerously loose car all night. We were fast at times, with the potential of a top 7 or 8 in the feature, but several spins, some instantaneous and dangerous, made our night very frustrating. In spite of the disappointing 16th place feature finish, we were lucky not to have brought this race car home a mangled mess. 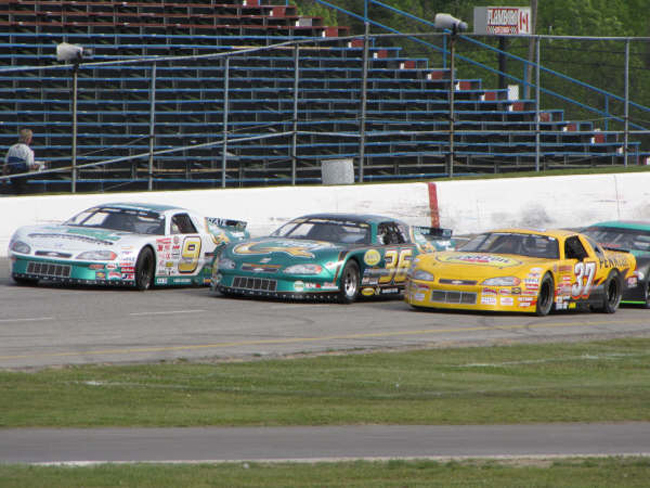 The whole story will be on our message board Monday with the Flamboro race report from Sunday as well…..Congrats to Ron Sheridan #52 and his team for winning the first JBM Autoleasing Triple Crown and to David and his team for starting the race two laps down and bringing the Pennzoil car to a strong 4th place feature finish. 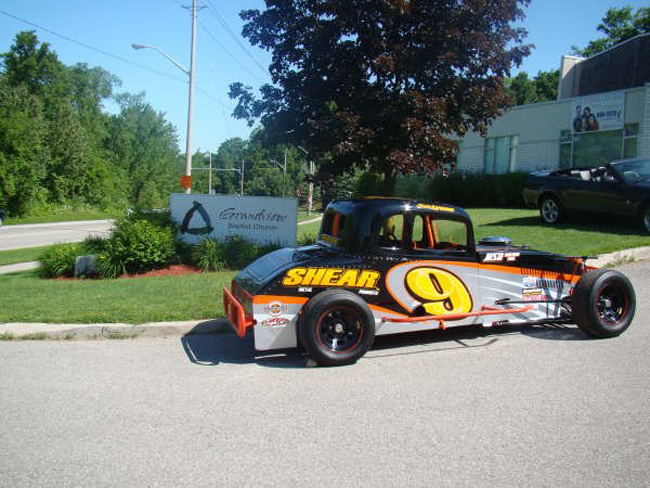 Linda Dean, driver of the beautiful Flamboro #5 Thunder Car asked us if we would participate in this community effort. The display we were part of was to bring awareness to street racing. “Eliminate Racing Activity On Streets Everywhere”. Too many people have been killed or seriously hurt because of street racing. I hadn’t heard of this movement before today, but I totally agree with it. We all speed a little at times, but it’s those who are going incredibly fast speeds over the limit that are endangering others. Hopefully ERASE can help educate youngsters who have the urge to speed. Let’s get them to the race track and take their frustrations out on the oval where racing is suppose to be done. Rob, #8 Flamboro Mini Stock, is parked between Linda and I.
Jason Shaw, the reigning Late Model Champion ran 2nd in our heat and the feature. Paul Howse was the big winner taking wins in both his heat and the feature. We ran 3rd in both races, although our experience in the feature was much different than Jakes. We were almost over come by what we thought was one of the speedy ASA boys from The Motordome Speedway in Pittsburg….But Wait!!!! “is that true”?…As the guy on the Mr. Lube commercial said…”well it maybe might not be true”…but that’s how it seemed, we were running great and in the way of at least one car who was, well, like an ASA car. The story is on our message board under Diary Of A Season. 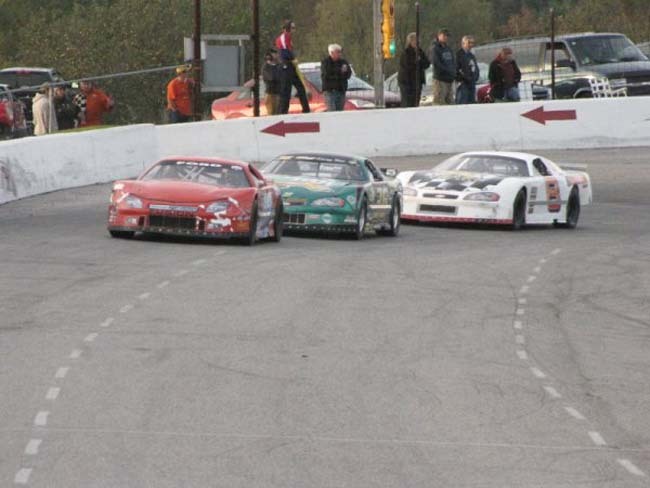 For those of you who may not remember, Jason, Steve Laking, Jamie Ramsay and I went to Pennsylvannia in mid October to run against the ASA 450 HP Late Models. We had about as much chance of beating those cars as we would taking our cars to an airport runway, where they had a huge long take off ramp, with hopes of getting enough speed to land on the moon. This week end there is no Late Models at Flamboro and we’ll be racing at Delaware Speedway with the #9 Freedom Village car. 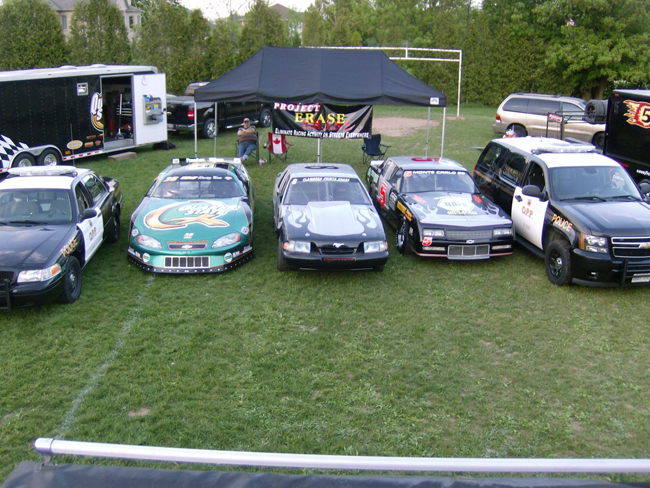 Flamboro has regular classes Thunder Car, Mini Stock and the former CASCAR Sportsman cars called O.S.S. We were driving along the 403 from Hamilton and it was absolutely beautiful. Blue skys and white puffy clouds. All along the 401 from 403 to just outside of London it was the same..sunny with blue skies. Then we got a call from Jeff Lancaster who was at the track…”hey Gary, it must be Friday night because it’s raining here”. I turned to look north and I couldn’t beleive it…”are you kidding me, look at the dark clouds”…and so it went. It rained a little then cleared up, but then some ugly weird looking clouds rolled in bringing with it this deluge of rain that naturally caused the races to be cancelled. Flamboro didn’t fair any better as they were rained out as well. We were on display twice today. This morning at Hidden Valley part for the annual Burlington/Aldershot United Way community day. It was awesome weather all day. Saturday night we took both #9 and #36 to the Freedom Village banquet in Mississauga. We got a lot of rain in the evening. Next week is the first Grisdale Triple Crown race at Flamboro. We have sponsors that have been with us for 10 years, 3 to 5 years and others new this year. We love and appreciate everyone always try to represent them equally. It sure seems incredible to fathom this sponsorship for an amazing 36 seasons…the longest on earth…maybe in the universe. 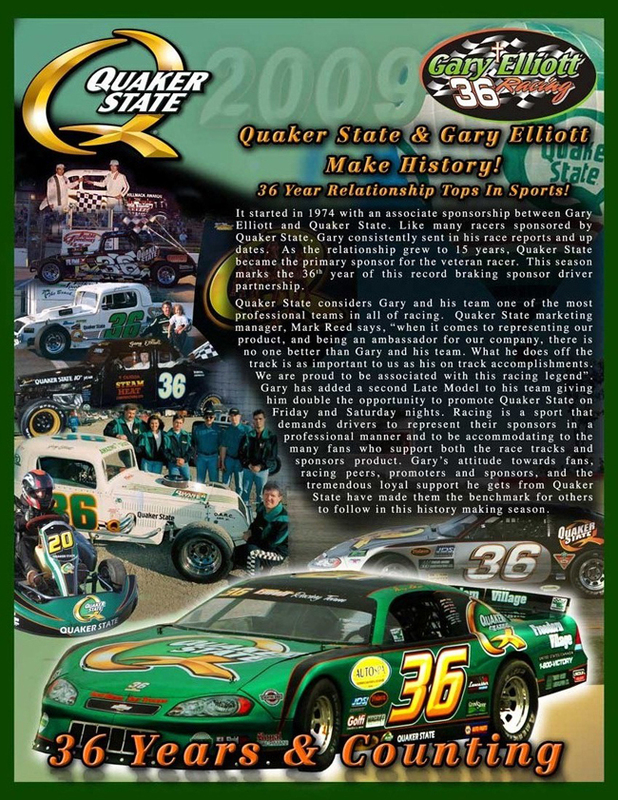 Thank you Quaker State for your incredible dedication to our sport and our team. Gord Nicholosn got this shot of practice at Flamboro. 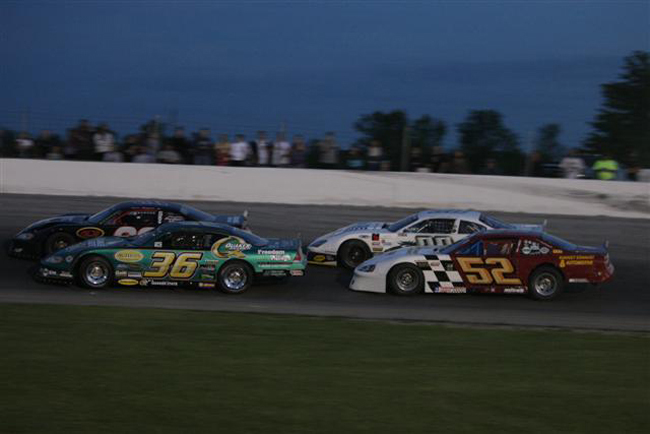 I’m sandwiched betweeen David and Jeff with Dave Baker right behind us……The first leg of the Grisdale Triple Crown series ran Saturday night at Flamboro Speedway. 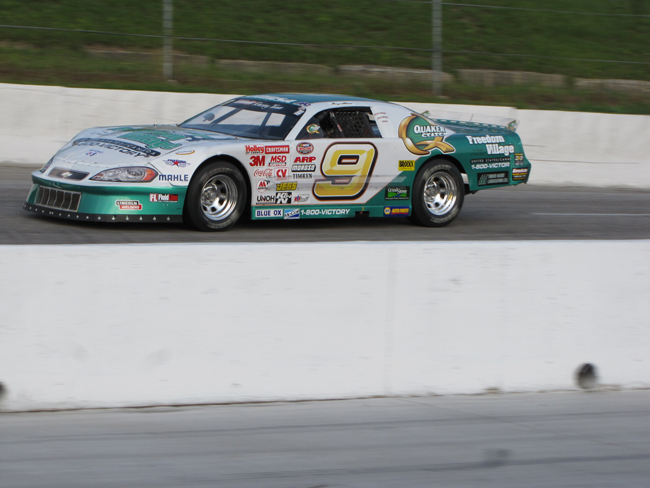 The race night was filled with controversy from qualifying to the feature finish. The feature is unofficial until Tuesday. Track management needs a few days to sort out the legalities of driveline parts from the winning car. The feature, a 75 lap event, only had one caution in the early going and then ran 60 laps non stop. “If he touches me once, I’ll spin him out”…and he did. Those prophetic words were spoken 4 days before the Grisdale Triple Crown night, brought on by others telling David about some of his peers being hit and spun out by the new kid in the quick black Monte Carlo. 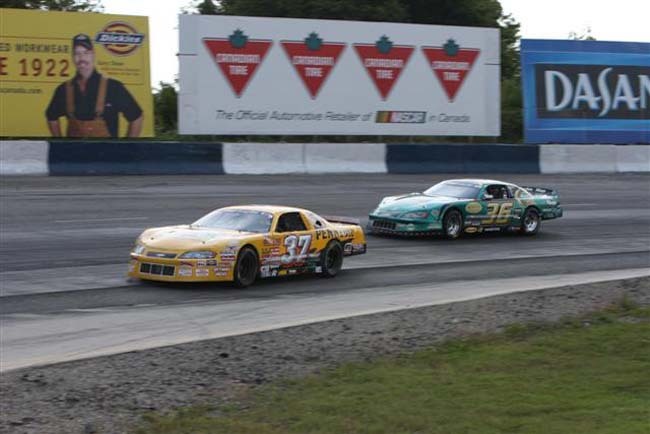 It only took lap two of their second heat for the fullfilment of the predicition…..What happend after was unfortunate…The reason the 2006 Flamboro Late Model champion won’t come back to race full time is because of the constant bad calls he got in the past from the Flamboro staff. In this race he was disqualified for rough driving. The picture sure validates that, but during the pre race drivers meeting we were told by the starter, if you spun someone out you went to the back of the pack. The said they wouldn’t disqualify you for that…but…they decided to disqualify David out of the race and hence ignited the kids rant with the officials who at first didn’t know what the call was or even why. David was waved to Tech by the corner man after the race, went to the tower and was told he was not disqualified but 10 minutes later was told he was disqualified, then when he asked why, the track manager didn’t know, then he was told for running into Shane on lap one, which he claims he didn’t do (it was at the start of the race going into turn one on the first lap and the 03 tried to make it 3 wide) the starter said David drove into Shane. The rest of this story is nuts as the track tried to justify this dumb call. Anyway, here’s the best thing to do, the race is on TV, Cogeco, on Friday night at 9:pm, and hopefully the camera man got a good shot of the start of the race. Then we’ll see if the call was right or not. Shane managed to get his car straightened out for the feature and smoked the field by restarting 20th on lap 15, taking over the lead on lap 58. He leads the Grisdale Triple Crown series. We started outside pole in our second heat and were able to take our first checker of the season. The win coupled with a 3rd in the first heat qualified us 4th best. The long feature race had two cautions early, but after the second the race went 60 laps non stop. Tomorrow night we’ll be at Delaware for double features (if it stays dry). I will drive the Freedom Village #9. Thatcher Krupp spent two nights with us getting the #9 set up. If we survive okay at the big oval, the car should be much better for Jeff Lancaster when we return to Flamboro on Saturday. Hope you can make one or both of the races, if not, we’ll up date this site with the results. Racing Tomorrow Night At Delaware……Maybe! Last week Scott Lindsay and Jamie Ramsay were feature winners for the Twin 30’s. In this photo, Jamie and his crew celebrate their first ever feature win on their home track…….Tomorrow night we’ll run Twin 30’s again as Delaware tries to make up for lost nights due to rain. We’re hoping for a dry Friday for the sake of the track. They only have so many nights to get the races in to make the NASCAR quota, and pay for the season. Flamboro is in the same boat and have lost nights so far in 09′ due to rain. Delaware may have to add some nights later on in the year to catch up on features. If they do…we’ll be there. Rain Takes Out Delaware Tonight…But! 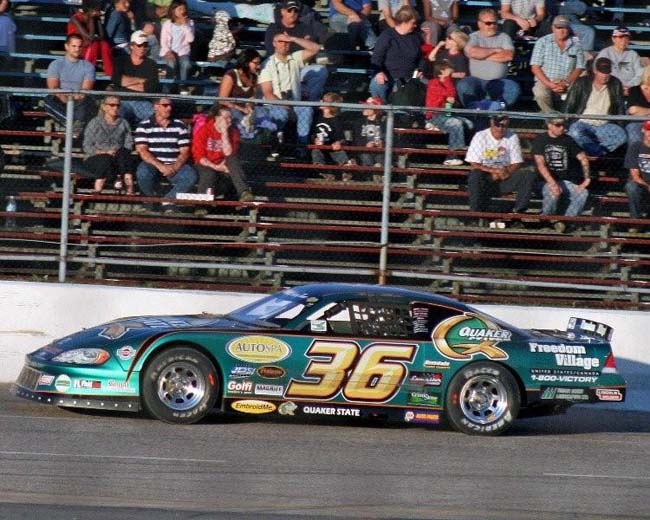 !…Super Late Model #36 At Flamboro? I know what you’re thinking! !…but this would be so neat, then I could run tomorrow night at Flamboro with OSCAAR….because tonight Delaware is cancelled due to RAIN!!!!!….. Anyway, this will be my car for the upcoming 3 Unit on line racing. It’s so good, you can wreck your car at 150 mph, the yellow comes out, you go to the pits and return without being a lap down, and best of all no damage…thanks to Mike Larkin for creating this design. It was a common theme for some churches to have a Father’s Day event. Steve Lyons took his car to his own church, Grandview Baptist, and we had our Late Model at Creswicke Baptist in Guelph. God allows His kids to race, and sometimes we get to bring our cars for show and tell. In the past few years we’ve had our race cars at many churches…Steve Lyons will be doing the same every chance he gets. It’s a great opportunity for us to share both racing and our faith. One thing you never want to do, cut down in front of someone at 120 mph, even at 110. This terrbile crash happened becasue of a miscommunication between me and my head spotter Jim. The miscue will do two things, take away Jeff Lancaster’s chance to race tonight at Flamboro, and take away any money I had saved. 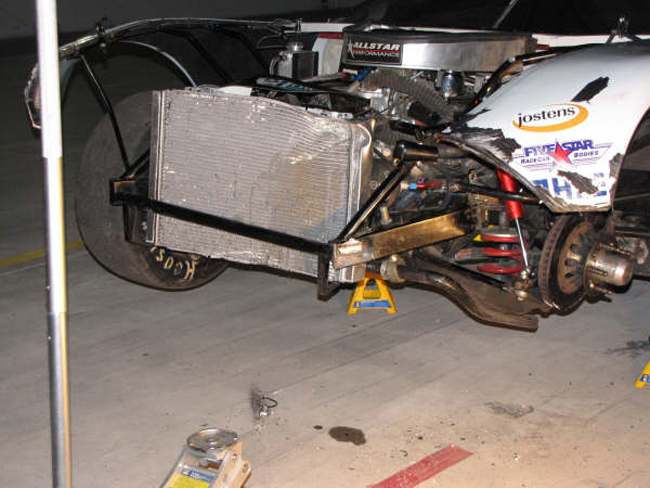 It was by far the hardest hit I’ve had in a race car, because of the speed, and by far the most damage. Mike McColl came by to see how bad our car was damaged, we immedialely made an appointment with him. We will strip the car down today and get it to Mike on Monday. The bad news is this will be a big ticket cost wise, the frame bent, lots of parts bent, crushed and many more intimidated…but not me. The good news?…we still have almost a full tank of gas….the full scoop on this tragedy will be on Diary of a Season by Sunday. Congrats to Steve Roblee who dominated this race, and to David for running steady, picking up a 7th place finish. I am surrounded by some great talent in this picture. Shane Maginnis #03, Scott Lyons #52 and Jason Shaw #82. Both Jason and Scott showed no mercy as they kept me outside for two and a half hours…well, it seemed that long, as I tried passing early race leader Ted Horsfall. Scott would go on to win, Shane finished one behind me (he’s laying low until the money race next Saturday) and Jason was hard luck as he got mixed up with the race leader and ended up scratch. We were lucky and unlucky. We were running 4th when the red flag was brought out. During that delay our left front tire went flat as we sat on the front chute. If the race hadn’t stopped for an emergency in the pits, we may have raced hard into the turn and been in trouble with the flat tire. As is was we were able to get it changed and end up 6th after starting at the back. You will see these boys and many others duel it out for the second leg of the Grisdale Triple Crown this coming Saturday…75 laps…should be good. Randy Shaw Reports “You Guys Have A Flat”! Sometimes you get lucky and other times you get unlucky. This deal was sort of both. 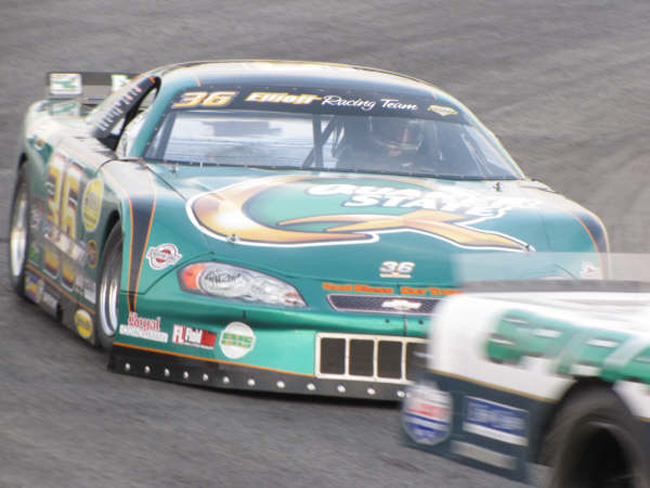 In the quest to dethrone Jason Shaw as reigning Champion in the Late Model class we need every good finish we can get. It was lap 14 when the red flag came out. Someone in the CVM pits was having trouble and the ambulance responded bringing out the “no move” flag. While we were sitting on the front chute comfortably in 4th place, I got the call from my spotter Jim that he was told by Randy Shaw that our left front tire was going flat. It wasn’t good news because it meant we would have to leave the track to change the tire…but…believe it or not, we were actually very thankful that the tire didn’t go down during the race. The possibilities for that scenario would not be good, maybe not as bad as the Delaware deal with the #9 car, but the chance of wrecking was real. Thankfully disaster was avoided thanks to the red flag. The full race report will be on our message board before the end of Canada’s birthday. This great action shot was taken by Jamie Maudsley Motorsports. We’re on about lap 63 and Paul had jumped outside on the restart on lap 60. We ran side by side for 4 or 5 laps. I held my lane and let him run on the outside and though I could see his car out my passenger window what I wanted to hear was “clear high”. On about lap 65 my spotter gave the call that we were clear to get to the wall and build up some speed. For the next 5 laps we held off the white #8. Coming off turn four for lap 71, we got a little loose and that was all Paul needed to gain that half car length on us. Going into one my spotter called “inside”. Staying up was okay because I thought he might get loose coming off and I would get the lead back. However he got an incredible run off turn two and we started down the back chute side by side. Now was the time to use strategy. Both my spotter and I were on the same page with the plan and as he yelled “let him go and follow” was exactly what I wanted to do. If I raced Paul down the back chute the door would have been left open for Jeff Stewart and Scott Lyons to capitalize, especially by the time we were in turn 3. By backing off a split second it gave us an opening to get in behind Paul and hold on to second. Congratulations to Paul, Tara, Junior, Chris and Paul’s huge fan club. He worked hard for the win as this picture shows….also thanks to my crew for allowing me to make history by leading a feature at lap 50, 60 and 70…never been done in 41 years…hey maybe were just starting to peak. We love racing at Delawre even though our best night so far has been a 12th. Our best ever at this track in Late Models is 11th, so we are eager to get a top 10 finish, the sooner the better. As we work on changing our performance at the track, we’re not sure what change we’ll see. We will however see a change in the way we look. This may be the last picture of this car fitted with black wheels. For the past 20 years all our cars have had chrome wheels, but when we rebuilt our new car over the winter we didn’t have any extra chrome. On Sunday I put a set of chrome spares from the #36 on the nine to see what it would look like and now everyone is nervous and anxious. The excitement comes from David who likes the black, as do half our crew, and excitement from those who want chrome like the other half of our crew, me and of course the good people at Grisdales as they anticipate a sale, maybe chrome wheels is all we need to get to the next level….anyway the Freedom Village Impala will have the week end off, heading to Delaware on July 24th for two features. The car will not only have new brakes with the new wheels but also new rubber for at least one of the features, likely the second. 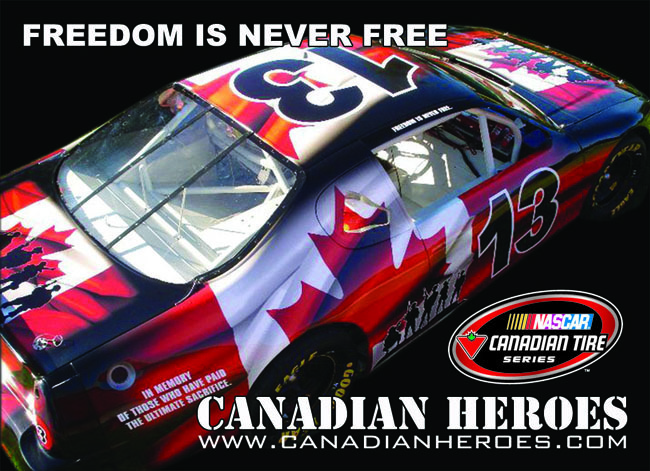 This Saturday we return to Flamboro for regular racing with #36. The severe wreck at Flamboro on July 18th, had a serious impact on the body and chassis of our car However we are happy to announce we will be ready for the third leg of the Grisdale Triple Crown on August 8th. We are running 2nd in the Mini series…………We had our best run at Delaware on Friday night, as soon as we get a picture we’ll post it here……We want to thank Junior, Sean, Dave, Marty, Jamie and Dave Watson for helping get our car ready for this past week end. Though it rained out, we were ready to go at it July 25th until the deluge took away any hope of racing. We’re off next week end, although a ride in something may come up…if not, we have 14 races in the bank and a night off won’t be too bad. We didn’t win, or get a podium finish, in fact we didn’t get in the top five, but it was our best outing at Delaware in a Late Model. Some might wonder why we’d consider finishing 10th a big deal, well actually we don’t, but it’s a small step forward and now we’re looking for a ninth or eigth place finish. Delaware is so tough for us. Getting off work to drive for an hour and a half, most always scrambling just to make warm ups and then run like a school bus in time trials…but we love racing and hopefully with some patience and good luck we can get a better finish. The big crash a few weeks ago didn’t discourage us, we intend on competing for the full schedule at Delaware as well as Flamboro. We not only had our best finish in a Late Model at Delaware, but we also debuted our new chrome wheels. We’ve always been chrome for over 20 years and once you’ve had chrome, you’ll never go black…or back. Next Delaware race is in 2 weeks. Next Delaware Show August 7th With I.S.M.A. In my final few years with the CVM, we decided to take only the necessary number of warm ups. We felt by reducing the times we went on the track, would save tires and equipment over a 24 race schedule. The opposite is true in this class, especially at Delaware. I need as much ice time as I can get so we can make changes to the car to get it closer for the features. I would like to get behind someone who’s a top 10 runner and try to follow them. The very quick cars are running much faster so those guys will have to wait for me to chase them. Cars running in the 19:3’s and 4’s are those we want to run with, and the only way to accomplih that is to make all the warm ups. Next time out, we will run every set of hot laps…..it should be a great show with the Super Modifieds running that night….thanks to Jamie Maudsley for this excellent shot of our car. Next Delaware Race August 7th With I.S.M.A. In our final few years with the CVM, we decided to take only the necessary number of warm ups. We felt by reducing the times we went on the track, would save tires and equipment over a 24 race schedule. The opposite is true in this class, especially at Delaware. I need as much ice time as I can get so we can make changes to the car to get it closer for the features. I would like to get behind someone who’s a top 10 runner and try to follow them. The very quick cars are running much faster so those guys will have to wait for me to get close to them. Cars running in the 19:3’s and 4’s are those we want to run with, and the only way to accomplish that is to make all the warm ups. Next time out, we will run every set of hot laps…..it should be a great show with the Super Modifieds running that night….thanks to Jamie Maudsley for this excellent shot of our car. Nonie came over after I hit the pits right after hitting two cars on the back chute of the last lap at full speed. She seen me sitting there pondering my future in racing…that lasted 3 seconds, then I was just started whinning after that…mostly in my mind, no one listens otherwise. The plan was to finish the race and present our #9 to Steve Lyons to run in the Grisdale Triple Crown on Saturday. As you can see the plan didn’t work, so naturally the grey matter was working overtime trying to figure how or why this could happen. Every racer knows the answer, however, we’re like 5 year olds when we’re tired, really wanting to get out of town unscathed, on the eve of one of the biggest nights in our 41 years, then have a wreck that we know will not allow us to rest the next day. Our plan was working fine until the last lap of the second feature. We were minding our own business runnng 3rd last when chaos struck just under 80 mph, maybe 90. I was discouraged for a few minutes, but after some counselling from Nonie, a good look at the car, then realizing it was 95% cosmetic, but would still require a full day to get it ready for Steve, I was a little less stressed. The full story is on our web site….many thanks to Troy, Dave and Allen Maclen for helping out on Friday. Allen will be running Late Models at Flamboro starting hopefully on the 15th of August. It was sad for us to hear the news of the passing of our friend Terry Dickenson. We extend our prayers and deepest sympathies to his lovely family. Terry was a true friend, helping Nonie and I on and off the track. He worked as a mechanic at Gary Brioux’s Shell and as Shop Foreman at Old Mill Pontiac. Terry was one of the fairest men I ever knew showing care for everyone. He fought for justice, especially towards the little guy, serving time on the Hobby committee, even as President. We have a tribute to Terry on our message board and welcome anyone who would like to add to it, to please say whatever comes to your heart about this fine man and great racer. This picture was taken in the summer of 1976. The familiar #92 with the big red horse, the icon of his sponsor Red Stallion, was always a contender every year he competed. His faith lead him to the ultimate checker flag where he will live forever and where there’s no more pain, no more tears and most only life. God bless you Terry and thanks for so many good memories. Grisdale Triple Crown Next……No More Rain!!! Going into the final race of the Grisdale Triple Crown, Paul Howse leads us by a single point. Jason Shaw is five back with Scott Lyons eight back of Paul. Heat races will play a major role in this mini series. We know the importance of making sure we finish well in both heats. It’s a double heat format, so where you start isn’t that crucial if it’s near the back, because you’ll get to start up front for the next race. However, starting in the middle of each heat can be an advantage, or in a heat with less competitve cars. Having trouble early in the feature might not put a contender out because he can still work his way back up, but losing a lot of points in the heats could have a huge impact on winning or losing this series. For us it’s awesome to be this close to first. It’s exciting and we are looking forward to the challenge…Steve Lyons was going to drive for Steve Laking in tomorrows race, but a bad crash in practice on Thursday night August 6th sidelined the #44 car indefinetly. 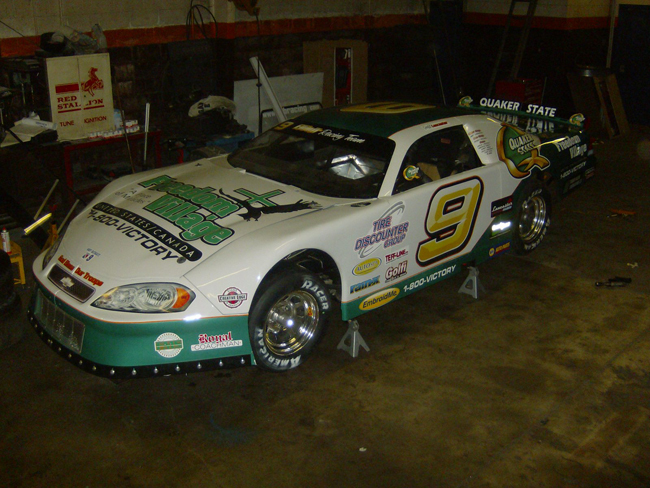 Steve will drive our #9 car in tomorrows Triple Crown….hopefully the rain stays away…oh ya, and especially the tornados. In this picture things are pretty good for David and I. We also survive the 2nd feature. In the big race David was taken out in a pile up on the back chute after getting hit from behind at high speed. He was okay but his car was badly beat up. Trevor Monaghan was driving the #9 and was spun coming off turn four. The body on the #9 was almost gone on the drivers side. When he retuned to the track he looked like the Terminator. He would go on to finish 19th of 37 cars in spite of the damage. Our car was terminated on lap 180 when I spun coming off turn two on a late race restart. That crash was one of our worst ever and has severely damaged the #36. We raced to 10th earlier in the race and if things had gone good for us we could have had a top 8 or 9. We ended up 22nd. I drove the car from turn 2 to our pit pad dragging everything. I probably shouldn’t have done that but was fueled on the dream that “maybe it’s not that bad, maybe it can be fixed right away”….the full story should be up on our site by tomorrow. This mess was a resutl of slamming the inside retaining wall at high speed. Coming off turn two the car broke loose and it was so quick there was no way to get out of the impending crash. We were running 12th at the time and looked like we could have had a top 10. 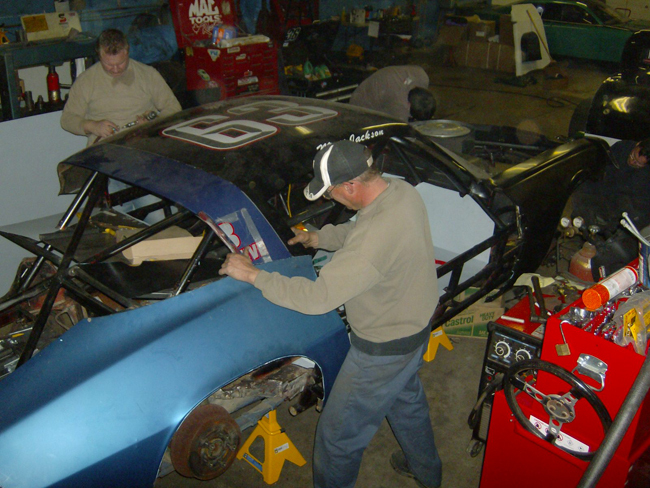 Now we got to get it back in shape to finish our Flamboro points chase. Our crew will be busy, good thing we’re off next week end. We always look forward to Delaware’s APC 300. The hype, big crowds and many great Late Model drivers make this event an awesome privilege to be part of. We were prepared, determined and in good physical shape for this marathon. What was missing was a little luck. Getting loose off turn one can be dangerous, doing it off turn two has one result, see the picture below. Sliding side ways at 70 or 80 mph with an inside cement retaining wall as your brake, is a devastating rendezvous. Our frame, ahead of the control arms was bent, as was the Quick Change tubes. The carnage was extensive with the rear section and front bumper assembly crushed, not to mention the many twisted parts like the rad, shocks, wheels, ball joints, control arms and my bank account. We have been very blessed to have received help from my own crew of Jason, Perry and Jim. However Allen, Dave and Marty have spent several hours during the day and night helping get both cars ready. Trevor Monaghan, Dave Watson and Junior Hanley have also helped, and Jim Sweers will do some painting next week. Our goal is to be out Tuesday night and test the car for next week end. We’re only a few points out of 3rd in the Flamboro standings and want to be in good shape for that challenge. Nonie and I thank everyone for their incredible support to get us back together. There is no way to really appreaciate the wisdom Junior Hanley has, unless you are blessed to work with him. He works alone on his own cars, so the only chance I had to watch him this close was to smash up my car pretty bad…and that I did. Junior always helps anyone who asks, and gives advice even if you don’t ask. The best thing to do when Junior talks is to listen and if it’s not clear what he said, ask him to explain more and he will, he loves to help racers. His wisdom is icredible and has no end. The biggest or smallest part of a race car makes no difference to him, he knows it all. In this picture Junior is helping us straighten both tubes on our Quick Change. The process seems a little 1960’s, but Stelco heats steel to bend it every day, and I guess it’s no different in this application. The Quick Change is set up with the port-o-power jack positioned to put just enough pressure on an alredy bent rim. The toe is in about 5/8th of an inch. There’s a lot of concentrated heat applied to certain spots on the back of the tubes followed by a quick blast of cold water from the garden hose to cool the red hot steel immediately. After a few hours of this process the axles went in and out easy. We checked the toe and I said it was perfect, Junior said “no it isn’t, it’s still out a 1/16th”! Then he smiled and said “but it will be okay”. Allen also did a lot of welding on our front clip. His racing friend, Fred, helped by welding most of our front bumper. Jason, Marty, and Dave all contributed to get us ready for this week end. Jim Sweers painted the quater panel on the #9 and Steve Lyons made the decals. In total, this deal was about $1500….th same amount we would have won had we finished where we were running. However the cost would have been more than double that if we sent it out for repair, so I am very gateful to all those who helped us….especially to Junior Hanley for spending a lot of time getting us geared up. We only have to scale the car to be ready for Flamboro. 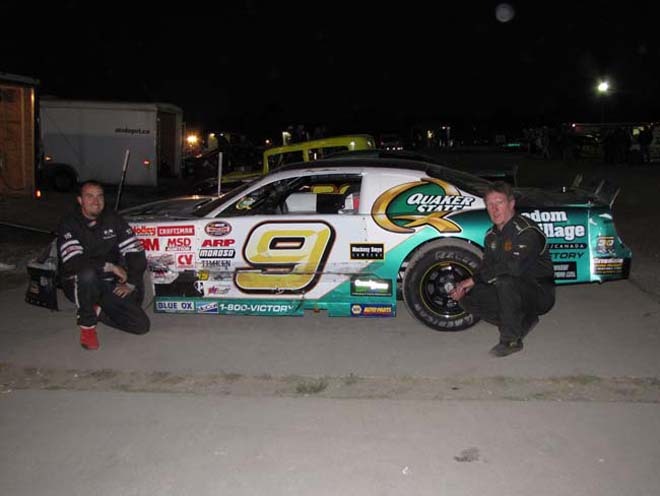 Matt Dean was the 4th driver to race the #9 this season at Flamboro. The Mini Stok ace enjoyed his ride, even though short lived. Matt was anxious to get some hot laps in the car prior to getting into competition, but our work load, especially on #36 was too consuming, taking all our extra time just to get it ready and back to where it was before the Disaster at Delaware. Two sets of warm ups were all he was awarded before being let loose in the small but competitive Late Model field. Matt’s first goal was not to get lapped, and he did just that. In fact he was a long way from being lapped in the heat finishing 7th. Imagine the difference both he and Jamie Watson experienced going from 19 second laps to the high 15’s. In the feature some bad luck took him out of the race when he hit Todd Campbell, knocking loose a wire for the MSD system. He made it to the pits but the car quit. We appreciated having Matt drive for us. He raced clean and hard. All of those who have driven the #9 this year, Jeff Lancaster, Jamie Watson, Trevor Monaghan and now Matt have done very well keeping the Freedom Village Impala in the hunt. Matt and his dad Steve were amoung a huge group of friends who helped get us ready. It was an incredible, exhausting 10 days repairing the bent chassis after the APC 300 wreck, but we did it at home, we didn’t send it out. More on that in Diary Of A Season. 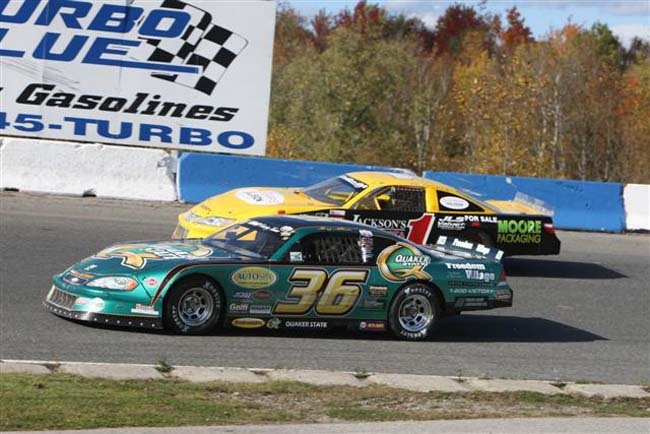 This week John Casale wants to give it a try…just kidding…Trevor Monaghan will race the next two weeks at Flamboro, the 26th being a warm up for Octoberfest. If Mike did check his mirror he would have seen the big Q, but apparently it didn’t fizz him one bit. 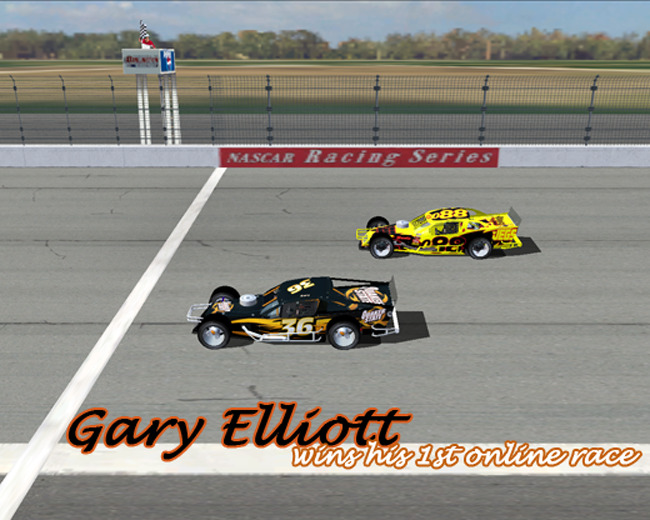 He was able to lead the feature from lap one to lap 30, being hounded for almost the entire race. He only got high once, but it wasn’t bad enough for us to get under him. The youngster drove a very hard and strong rac. The Bently team have had some trials and tribulations this season but it was all gone after the checker waved with the kid up front, congrats to them for an excitng win……While the Bentley’s were celebrating the win, #8 Paul Howse, and his team, were also celebrating as they captured the Late Model points Championship. The full story of this race is on Diary of A Season on our message board. Last summer TQ racer Neal Cox,to my left, asked me if I would speak at his church, Emmanuel Baptist in Barrie at a Men’s Ministry breakfast. Naturally I wanted to go, it’s part of what my team and I have been doing for the past 20 years. Many times my crew came with me, only this time I was afraid they may not be so enthused to be at my house before 5:30am so we’d be at the church before 7:30am. To my surprise they were all willing to go and were ready to make the hour and a half drive for this great outreach. Over 220 men and boys attended this event. We headed home at 10:30 am, and though the races were cancelled due to rain, it didn’t dampen our spirits at all. It was a very successful outreach with 15 men making a commitment to receive Jesus Christ. Now we rest and go to Flamboro for day one of the Octoberfest Classic. 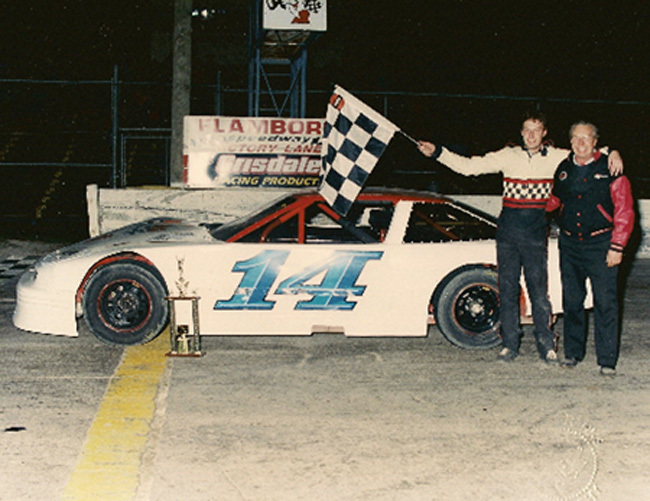 When I pulled on the track I saw the yellow #1 beside me and thought it was Larry Jackson. I knew Larry was in our heat, and I thought how weird it was that Larry was running the same colors and number as the Limited Late Model legend Vic Parsons. The car even had a sponsor name Jackson on it. I would never have expected Vic Parsons to be in our race because he ran Limited Lates. It wasn’t until after the race that I found it was indeed Vic Parsons and I was upset that I missed the moment. 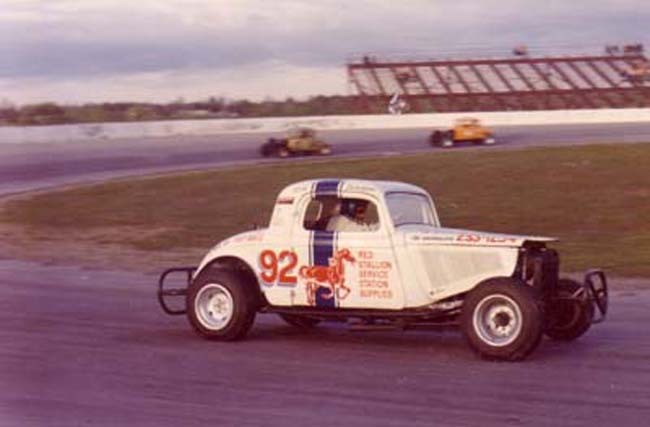 How could I not know, my hero, the CNE Late Model driver of the 55 Chev, #9 Cobra, sponsored by 400 Auto Wreckers….was right beside me!!! I found Dave Franks and asked him if he would get a picture of Vic and I for the second heat. He said he would do that. But Quick Vic was having engine trouble and wasn’t planning on running anymore races, maybe one lap in the feature. Dave checked his photo’s from the first heat and got this shot, and I am thankful….I remember going to the races at the CNE every Friday night. I would watch my hero #36 Glen Schurr race his Super Modified. 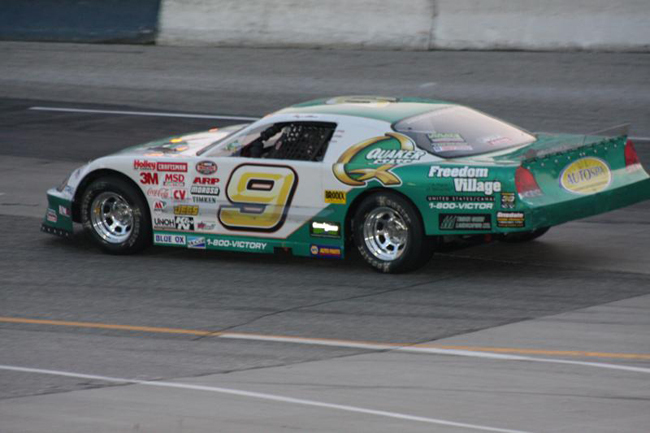 The Supers were replaced with the Late Models and my favourite was #9 Vic Parsons. He earned that right by the way he raced and by his attitude towards fans. One day my friend Stewart Pitchford and I went to the pits to take over the Mid Season Trophy for the track promoter. Once there we met two racers. One was grumpy and basically told us to beat it, the other answered our questions and made us feel welcome. The latter was Vic Parsons. I cheered for him until he retired. He came back 20 years later to dominate in the Limited Late Models, and as proof in this picture I finally got to race with him….If anyone has a picture of the #9 Cobra 55 Chev Coupe I will put it on here. I had two number 9’s that were my hero’s…Andy Bathgate and Vic Parsons. Andy Bathgate was captain of the New York Rangers and I never stopped cheering for him either. My second Late Model was going to be number 9 to honor both Mr. Bathgate and Mr. Parsons….now I just get on the ice with Andy Bathgate. 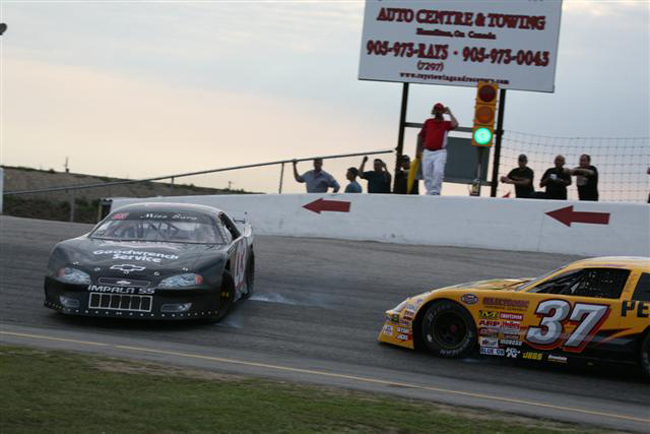 This week end Flamboro Speedway hosts the final race of the 2009 season in Ontario. The Twin 50’s should draw 20 plus cars to compete for the biggest purse of the season paying $3000 to win. David won this race in 2008 and we won it in 2007. The track has failed to recognize the Octoberfest winners the past two seasons. The format use to be a single 100 lap race, but was changed in 2007 to two 50′ lap features, with a reverse start of the first finish making up the 2nd feature. We explained to the management team in 07′ that having that format would promote sand bagging because of the way the track was paying an equal amount of money in each race. They didn’t see it and left it as it was. Last year, the driver finishing 20th in the first and 1st in the second feature made more money than the overall Octoberfest Champ, who finsihed 3rd and 4th, by $800. Finally, over the winner, the track listened to our plea to make it an overall pay off based on the best combination finish in both races. So this years winner will not only be crowned the Late Model Octoberfest champion, but also win $3000. Our cars are ready after suffering cosmetic damage last week at Peterborugh, as shown in this Dave Franks photo. Trevor has continued to improve each week and will be a contender to take home the gold. Our car was fast at Peterborough and the past two weeks at Flamboro giving us hopes of being a multi race winner as the Octoberfest champ. Races start at 3:pm on Saturday and Sunday. Saturday is qualifying with the OSCAAR feature as well as the CVM Clash running Saturday night. All other features will be run on Sunday….you won’t need an umbrella, but a snow suit might be a good idea. Trevor flys down the back chute in the first feature at Flamboro. Qualifying 3rd after a 2nd and 4th in his heats, he fell back early, getting stuck on the outside. He soon got rockin’ and held off a few attempts by Simon Wild #106, bringing home an 8th place finish in this feature. Trevor had a few good runs at the end of the season including a 6th place finish at Autumn Colors. I enjoyed running with Simon again. He was a regular a Flamboro but left a few years ago. Simon ran the APC 300 and Autumn Colors, and was one of a half dozen racers who made all three fall clasics. We will meet with our team soon and go over the plans for 2010 that will include bringing our CVM back. 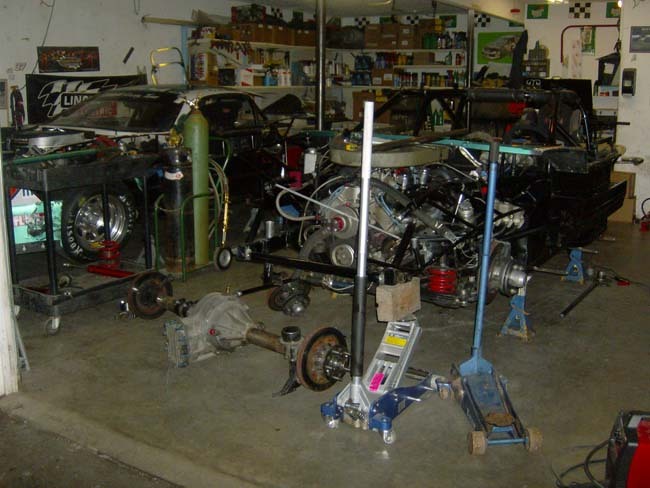 The acceptance of the Crate engine as an alternative for 2010 made me very happy and I plan to run a full schedule in 2010 in both Late Models and the CVM. On Saturday, some of our crew and family helped support the United Way “Plane Pull” at the Hamilotn Airport. 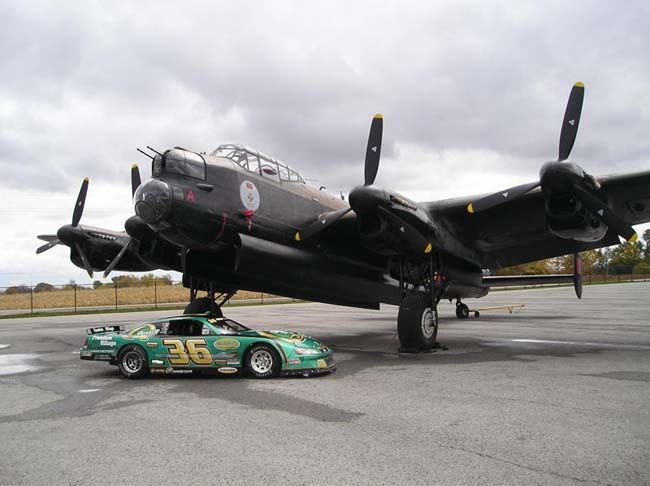 Teams signed up to see how long it would take them to pull this Lancaster Bomber 25′. Each group entering paid $500 with all proceeds going to the United Way. Quaker State supports this worthy charity and we were there to represent our sponsor for this important event. Special thanks to my crew Jim, Perry, Marty and Bruce for coming out as well as Donna, Trevors mom, Trevor, Brooke and their children. Our grand daughter Lauren and Jim’s son David also helped hand out pictures to the kids who were there with their parents. Flamboro Speedway had their annual banquet last night at the Waterdown Legion. One of the awards given to each class was Best Appearing Car. We won this award in 2005 and 2008. Those two paint schemes were different from each other and our 2009 car, and it was decided to make this yearss car different again. Thanks to the efforts by Jim Sweers to take spend the extra time to lay out the paint the way we wanted and the magic by Creative Edge, perhaps our best ever lettering job by Steve Lyons, we were blessed to win this award again. We like the look of the car so much, it may be with us for a while. Winning this award was largely due to the work by Jim and Steve, but both would attest that keeping the car looking great every week is perhaps as important as getting the right paint scheme in the first place. For that I want to thank my crew Jim, Jason, Perry, Marty, Troy, Sarah and Allen for helping to that end. Each of us would agree however, that Marty made a superb effort in keeping the car looking awesome week after week putting his final touch before every race night. We also want to thank all our sponsors for being part of our team and helping us to finish 3rd in the Grisdale Tripe Crown, 4th at Flamboro and winning our 3rd Best Appearing Car award in 5 seasons with Late Models. Terry Bauman, a motorcycle dirt and ice racer from Michigan, painted this Cot car in a scheme that will very likely be close to what we use for our 2010 #36. Terry his brother Tom, along with the Larkin family and many others from Ontario and the United States race every week, sometimes 3 or 4 nights in two series. Web sites are 3 Unit. and Rolling Thunder Gaming .com. It’s not easy to race these cars competitvely against those who have been doing it for years. I almost always qualify last and the only reason I finish in the top 10 of 20 cars is becasue of attrition. It takes practice to get good. The great thing about on-line simulated racing is that when you wreck or crash badly you just have to push “eascape” and then “return to pits” and a second later your car is like new ready to go. That only works in practice and happy hour, once the game starts you have to be careful because when you wreck bad your spotter comes on and says “we got big-time engine trouble buddy”, and when you hear that you know even if you keep racing you will be 60% power at best…some of the kids who race on-line, race go-karts at Flamboro Speedway and they are very good at it. Don’t worry, I’m not leaving real racing for computer racing even though it’s cheaper, safer, less tiring with unlimited tires and repair budget. However, it is a fun way to pass time over the winter with a great bunch of guys who go out of their way to help making it a great evening of entertainment. Jim, Jason, Marty and I got our 2010 season rolling with the stripping of both #9 and #36. Here Jason manouvers the engine hoist as both cars have bodies and drive lines removed. 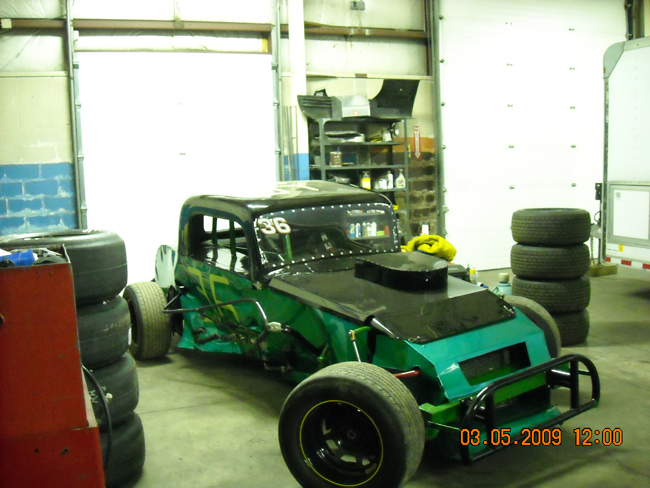 The two cars will head to McColl Racing this week to have repairs and upgrades installed for 2010. The #9 will be converted totally to a coil over strut system. 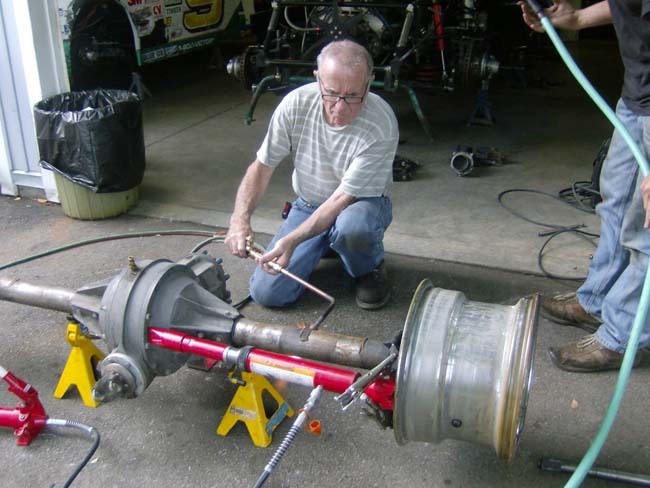 We were going to do the same to #36, but advice from a great racer and friend suggested to save the cost in going coil over/strut and take the 50 pound weight brake instead. We will however make sure the car is the best it can be with the chassis set up we used last season. Jason and Paul were faster than us most nights, but we will explore some ways to pick up lap times and be more competitive. 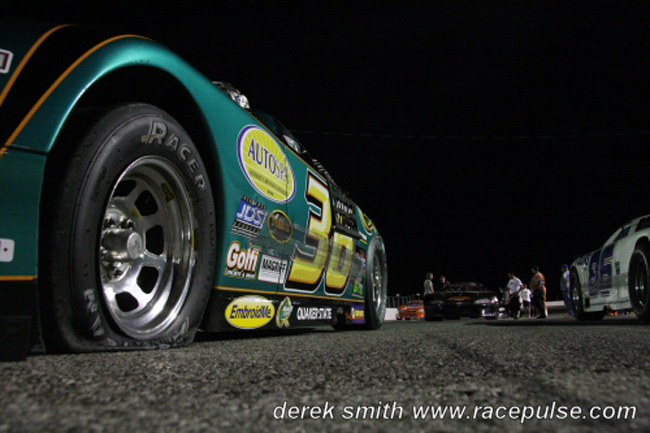 We finished every Flamoro Late Model feature in the top 10 in 2009, the only team to do that. We were beat in the heats, with both Jason and Paul winning 8 or 9 each. This season will be different because a double heat format will be used, the only fair way to count points, otherwise it’s luck of the draw and it was obvious with only 20 points separating the top 4 in Flamboro points, heat races had a huge impact. We plan to be ready for the coming season and go after our first ever Late Model title. It won’t be easy, that’s what will make it special, not to mention winning a Flamboro title period.